It’s obvious that Mimi Videnova cares about her students. Her innovative teaching approach and drive to succeed have resulted in numerous awards for her students. But Videnova is equally committed to – and passionate about – improving education for all in her native Bulgaria. She was recently named to the Ministry of Education’s Advisory Council for Innovative School and Pre-school Education, which according to Education Minister Sergei Ignatov, “always keeps us one step ahead of the problems of education.” As part of the council, Videnova was recently invited to referee the new curriculum. She also represented her school at the national conference “Information Technology in Education – Necessary Investment in the Future of Bulgaria,” a meeting jointly organized by Microsoft Partners in Learning and Bulgaria’s Ministry of Education and Science. The conference, attended by over 150 teachers, university professors, and representatives of NGOs, government and municipal officials, gave Videnova an important platform to share what she’s learned in her efforts to integrate technology and innovation in the classroom. to innovate, whatever their challenges. My achievements have a direct impact on the application of innovation in our school. My first project was to equip an interactive classroom. We won an international project grant worth $100,000. We got tablet PCs and I completed the equipment with an interactive whiteboard. My next project was connected to the use of new technologies in the daily training of students. I created the project “Math and Technology,” which combined the teaching of Information Technology with teaching mathematics in grade 9. My colleagues are actively involved, and for two years, the project has worked and delivered good results. The project continues to evolve. This year other colleagues adapted the project for students from grade 6 and 7. With my work and my enthusiasm, I inspire my colleagues. In our school, we have many good teachers and I am happy that we are able to work together, share ideas and develop plans. I have shared my ideas and projects and presented the benefits. People see the results of my work. This year my students participated in three different competitions. Students from 5th grade won a prize for best poster design in a national contest. Other children in 5th and 6th grade classes won one gold, two silver and one bronze medal at the European competition for computer drawing. And two great 8th grade girls participated in the competition for Web programming. These results cannot stay unnoticed. Another advantage of my work and the rewards that I get is visibility. It is much easier for a person who is known to present new ideas. But to reach this level took hard work and overcoming many obstacles. I can’t say how to generate high levels of attention and engagement as a result of careful planning and execution of specific strategies. But I know that every teacher can create a classroom environment in which engagement is the norm instead of the exception. Teachers must love their job and children. They must be creative. And if they really want to implement new working methods, but have no ideas, they can seek out shared experiences and adapt them to their education systems and their students. It’s easy for me. I have a deep understanding of technology and I can see how it supports my work. When I make lessons for my students, I don’t think “Is this innovation or not?” I look around for fresh ideas. I want to have fun. If it’s interesting to me, I know that kids will enjoy it. If it’s interesting to me, I know that I can inspire the children. If it’s interesting to me, I know that this is something innovative. Work is a pleasure for me. Therefore things happen. I think the biggest obstacles are ahead. My goal is to help improve education in our country. Hindrances will be many. How I will overcome them, I do not yet know. But I will follow my dreams. Obstacles are everywhere. When a person has a purpose, he or she finds a way to overcome any obstacle. What is your country doing right to support education? What conditions must change in your country to better support education? rejection of education as a value, etc. These are not just problems of the educational system. We need to change the thinking of society, but this doesn’t happen overnight. Along with this we have to keep up our best practices, which give good results. There is no universal recipe. There are many opportunities for innovation in education, but they are different for each country, for each school, for each class. We need an individual approach for good results. But technology is the easy way for innovation, and we must use this opportunity. Be well prepared. You should be interested in the latest news related to your discipline in order to show the usefulness of the study of the subject. Work conscientiously, regardless of results. The results will come later. Show self-confidence and self-esteem. Be a person! Love your job and the children! The use of technology as a support for good education is a positive trend. Each of us has one universal educational tool, and this tool is our brain! Train your brain. Cultivate your mind. I would say to everyone: read on! Read books, read more and more. And use your knowledge to create a beautiful world! 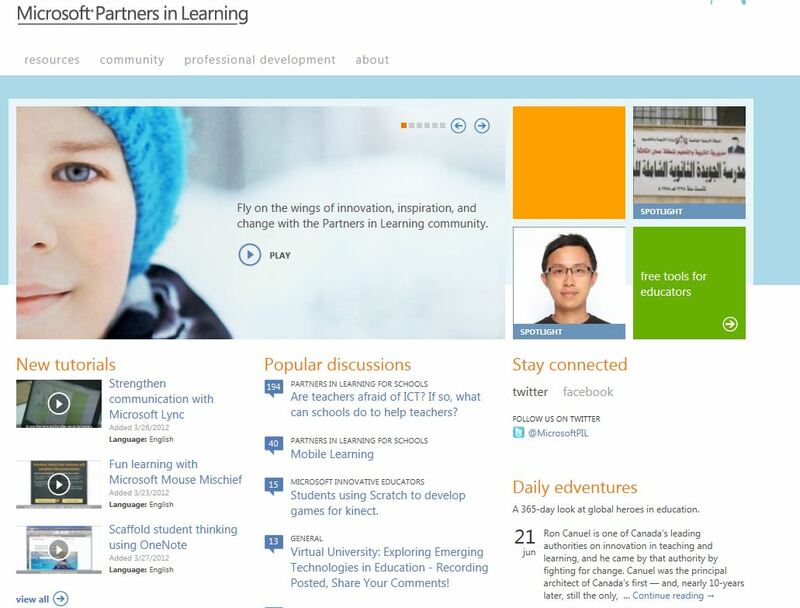 Join the Partners in Learning Network and experience global collaboration! Embraced by the theme ‘Your Ideas Matter’ the Partners in Learning Network is a community for you, by you, and further amplifies the great work that is being done every day by teachers and schools around the world. With this idea in mind, we invite you to try out this global online resource and community designed to encourage collaboration and the spread of ideas for the betterment of education worldwide. The new Partners in Learning Network is the next generation of the global network serving educators and school leaders in over 115 countries. To facilitate a truly global community of innovative educators, the site is now available in 36 different languages, thanks to the use of Microsoft Translator Services. Sign in, create an account and start connecting with thousands of educators worldwide here. Global Partners in Learning Network, a member of ISTE, an associated member of the CIO Bulgaria, Bulgarian Association of Information Technology, idg.bg (IT Portal, services and prices), my personal website, and facebook.com. Person who inspires me most: When I think about it, there are many people who have inspired and touched me in some way. I do not make idols or graven images. I take something from every person who crosses my life! Favorite childhood memory: I had a wonderful, happy and peaceful childhood. When I was little, near the house of my grandparents was a huge oak. I loved to organize picnics for my friends under overhanging branches. And now, when I see a huge oak, I feel sure, comfortable and safe. Next travel destination (work or pleasure): I do not know. For me, things happen spontaneously. Only fate knows what my next destination. The Lord of the Rings and The Hobbit by JRR Tolkien. “The Hobbit” is the book that I am reading now. There are so many books that I like. I love to read! listen to must match my mood at the moment. Your favorite quote or motto: Miracles will come but you must do your part! This entry was posted in People, Physical Learning Environments and tagged Microsoft Partners in Learning. Bookmark the permalink.